This page is under construction. In the meantime, please see these references for an essential introduction to the CAZy classification system: [1, 2]. CBMs, in particular, have been extensively reviewed[3, 4, 5, 6]. Figure 1. An example of modularity in a CBM-containing glycoside hydrolase. Sialidase from Micromonospora viridifaciens contains an N-terminal CBM32 (red) X20 linker (yellow) and a C-terminal catalytic GH33 module (green). Graphical representation of modularity in amino acid sequence (top) and 3D crystal structure (bottom) PDB ID 1eut. Carbohydrate-binding modules (CBMs) are defined as an amino acid sequence within a larger encoded protein sequence and fold into a structurally discreet module, forming part of a larger multi-modular enzyme (Figure 1). The role of a CBM is to bind to carbohydrate ligand and direct the catalytic machinery onto its substrate, thus enhancing the catalytic efficiency of the multimodular carbohydrate-active enzyme. CBMs are themselves devoid of any catalytic activity. CBMs are most commonly associated with Glycoside Hydrolases but have also been identified in Polysaccharide Lyases, polysaccharide oxidases, Glycosyltransferases and plant cell wall-binding expansins . CBMs themselves do not generally undergo any conformational changes when binding ligand. Rather, the topography of the carbohydrate-binding site is preformed to be complementary to the shape of the target ligand (see Types). This is achieved by the presence of amino acid side chains and loops within the CBM binding pocket or cleft. However, multimodular enzymes as a whole may be quite flexible and undergo significant conformational changes when binding substrate. Flexible Ser-Thr-Pro sequences, which are often O-glycosylated, link adjacent modules and can allow for shifts in the orientation and direction of the catalytic module with respect to the CBM on the target substrate . CBMs were initially characterized as cellulose binding domains (CBDs) in cellobiohydrolases CBHI and CBHII from Trichoderma reesei [10, 11] and cellulases CenA and CexA from Cellulomonas fimi . Limited proteolysis experiments of these enzymes yielded truncated enzyme products that showed a reduced or complete loss in their ability to hydrolyze cellulose substrates. The reduction in enzymatic activity was attributed to the loss of ~100 amino acid C-terminal domains which prevented the adsorbption of the enzymes onto cellulose substrate. Thus it was proposed that these independent "domains" are critical for targeting the enzymes onto its substrate and enhancing their hydrolytic activity. It rapidly became evident that CBDs were not only appended to cellulases but were also found in a range of other plant cell wall degrading enzymes [13, 14, 15]. CBDs were previously categorized into 13 Types based on amino acid sequence similarities . This classification system became complicated when similar functional domains from non-cellulolytic carbohydrate-active enzymes were discovered that did not bind cellulose but met all of the criteria of a CBD (for example see ). The term carbohydrate-binding module was proposed to solve this problem to be inclusive of all ancillary modules with non-catalytic carbohydrate-binding function (for a review see ). Since this time, CBMs have been found appended to enzymes that interact with almost all characterized carbohydrate sources found on Earth (Table 1). aBased on the Carbohydrate Active enZyme database. CBM7 is a deleted entry and CBM33 is now reclassified as Auxiliary Activities family AA10. bonly human lectin malectin has been characterized, however a search based on amino acid sequence similarities found that similar modules are appended to many uncharacterized glycoside hydrolases . Carbohydrate-binding modules are currently classified into 67 families based on amino acid sequence similarities (May 2013), which are available through the Carbohydrate Active enZyme database. Sequence-based relationships often cluster together modules with similar structural folds and carbohydrate-binding function. While this is true for most CBM families, there are several families that exhibit diversity in the carbohydrate ligands they target (see multiple entries in Table 1). Figure 2. Classical CBM beta-sandwich fold. C-terminal family CBM27 from Thermotoga maritimamannanase, a Type B CBM (A)(side and front view, PDB ID 1OF4)  and C-terminal family CBM6 fromClostridium stercorarium xylanase (B) (PDB ID 1NAE)  showing binding sites on the face (A) and edge (B) of the beta sandwich fold respectively. Structural information for 54 of the 67 CBM families is known. CBMs fall into one of 7 fold families . The most common fold exhibited by CBMs is the beta-sandwich fold which is comprised of two overlapping beta-sheets consisting of three to six antiparallel beta strands (Figure 2). The ligand binding site is located primarily on the same face of a beta-sheet (Figure 2A), but may also be positioned on the edge of the beta-sheet within the joining loop region (Figure 2B). There are examples of CBMs in the beta-sandwich fold family exhibiting dual binding sites such as CBM6  and dual starch-binding sites in CBM20 . Other fold families include the beta-trefoil fold, cysteine knot, OB fold, the hevein and hevein-like and unique folds . CBMs of the beta-trefoil fold family (CBM13, CBM42) present multivalent sugar-binding sites, as demonstrated for their interaction with xylan and arabinoxylan respectively . Figure 3. CBM Types. (A) Schematic of different CBM Types binding with different regions of a polysaccharide substrate. (B) Type A CBM2b from Pyrococcus furiosis GH18 chitinase(PDB ID 2CRW) . Aromatic side chains of Type A CBMs form the planar binding surface. Type A: bind to crystalline surfaces of cellulose and chitin (example families CBM1, CBM2, CBM3, CBM5, CBM10). Their binding sites are planar and rich in aromatic amino acid residues creating a flat platform to bind to the planar polycrystalline chitin/cellulose surface (Figure 3B). Type A CBMs are unique and differ significantly from Type B or C.
Type B: bind internal glycan chains (endo-type). Type B are the most abundant form of CBMs reported to date. Type B binding sites appear as extended grooves or clefts comprised of binding subsites to generally accommodate longer sugar chains with four or more monosaccharide units (see Figure 2A for an example). 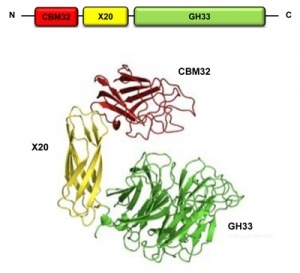 There are some examples in CBM6, CBM36 and CBM60 that contain only two subsites. Type C: bind termini of glycans (reducing/non-reducing ends, exo-type). Type C binding sites are short pockets for recognizing short sugar ligands containing one to three monosaccharide units (example families CBM9, CBM13, CBM32, CBM47, CBM66, CBM67). Families containing Type C CBMs often include lectins as members. Targeting Effect: CBMs target the enzyme to distinct regions within a larger macromolecular polysaccharide substrate (reducing end, non-reducing end, internal polysaccharide chains), depending on the architecture of its binding site (see Types). Proximity Effect: CBMs increase the concentration of enzyme in close proximity to its polysaccharide substrate. This leads to more rapid and efficient substrate degradation. An excellent example demonstrating targeting and proximity effects of plant cell wall specific CBMs is available . Disruptive Effect: Some CBMs have been shown to disrupt the surface of tightly packed polysaccharides, such as cellulose fibres and starch granules, causing the substrate to loosen and become more exposed to the catalytic module for more efficient degradation. Disruptive roles have been described for cellulose binding CBM2a  and CBM44 . Dual starch-binding domains of family CBM20 from Aspergillus niger glucoamylase have been shown to disrupt the surface of starch  while dual-associated CBM41 modules may have a disruptive role in degrading glycogen granules . CBM33 was thought to have a disruptive effect on chitin, however these have now been reclassified as Copper-dependent lytic polysaccharide monooxygenases  and are reclassified as Auxiliary Activity Family 10. 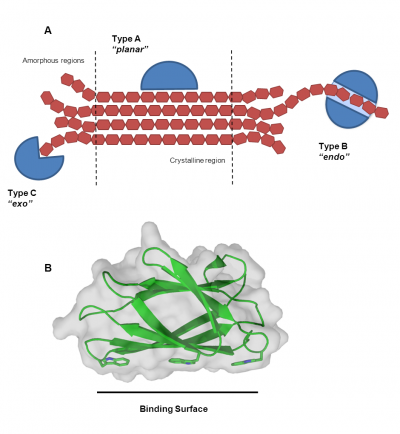 Adhesion: CBMs have been shown to adhere enzymes onto the surface of bacterial cell wall components while exhibiting catalytic activity on an external neighboring carbohydrate substrate. For example, CBM35 modules have been shown to interact with the surface glucuronic acid containing sugars in the cell wall of Amycolatopsis orientalis while the catalytic module is active on external chitosan likely originating from the cell wall of competing soil fungal species . There are two key features that drive CBM/carbohydrate interactions. Extensive hydrogen bonding occurs between the hydroxyl groups of carbohydrate ligands and polar amino acid residues within the binding site. Additional water-mediated hydrogen bonding networks between these groups can also be found in the binding site. By far the most important characteristic driving force mediating protein-carbohydrate interactions is the position and orientation of aromatic amino acid residues (Try, Tyr and sometimes Phe) within the binding site. These essential planar residues form hydrophobic stacking interactions with the planar face of sugar rings. Weak intermolecular electrostatic interactions occur between C-H and pi electrons in the planar ring systems and contribute 1.5 - 2.5 kcal/mol energy to the binding reaction . CBMs may also use coordinated metal ions within the binding site to directly interact with their target ligand. For example, families CBM36  and CBM60  exhibit calcium-dependent binding to xylooligosaccharides. CBM-carbohydrate interactions in general are quite weak (Ka affinities in mM-1 to uM-1 range) making the interaction easily reversible. This feature allows for "recycling" of the appended enzyme to bind to a new region on the substrate once catalysis has been completed at a given site. Because of the diversity of carbohydrate structures and motifs found in plant and mammalian glycans, some CBMs have become adapted to recognize more than one type of monosaccharide or glycosidic bond linkage within the binding pocket, a feature called CBM promiscuity. For example a family CBM32 from Clostridium perfringens NagH binds N-acetyl-glucosamine in the primary subsite but can accommodate N-acetyl-galactosamine or mannose in the secondary site . There are several examples of ligand promiscuity within family CBM32. In plant cell wall recognizing CBMs, they are often able to accommodate both cellulose and hemicelluloses. For example, several family CBM6 members interact with cellulose, xylose or laminarin [20, 37]. Family CBM37 exhibit broad binding specificity for xylan, chitin and cellulose (ref). Family CBM41 appended to a GH13 pullulanase can accommodate both alpha-1,4- and alpha-1,6-linked glucose found in amylopectin (from starch/glycogen) . The flexibility in carbohydrate recognition by CBMs contributes to the targeting efficiency of carbohydrate-active enzymes in environments where there is diverse range of polysaccharides present (such as the plant cell wall or mammalian tissues). Multivalency is the collective strength of several interactions with a given ligand. Because CBM-carbohydrate interactions are relatively weak, some carbohydrate-active enzymes, mainly glycoside hydrolases, have developed ways to increase their interaction with substrate via a multivalent effect. Individually, some CBMs may contain multiple binding sites to form a multivalent interaction with their target ligand, although this form of multivalency is quite rare with only a few examples (CBM6, CBM13, CBM20). More commonly, glycoside hydrolases may contain more than one CBM within its modular architecture, either arranged in tandem or at opposing N and C terminal ends of the protein sequence, or both. These CBMs may target the same carbohydrate ligand, different regions within the same ligand, or different ligands within a larger polysaccharide amalgam. A multivalent interaction enhances the overall affinity of an enzyme for its substrate but more importantly, tandem CBMs will cooperatively target the enzyme towards specific regions within a larger polysaccharide substrate based on the orientation and position of binding sites with respect to one another. (Insert some examples here). Several lectins [39, 40] fall into the CBM classification system in the Carbohydrate Active enZyme database as they exhibit similar folds and carbohydrate binding properties with CBMs. For example, ricin toxin B chain from Ricinus communis resides in family CBM13, while wheat germ agglutinin (WGA) can be found in family CBM18. The human lectin malectin is classified as family CBM57 and plays a role in N-linked glycan processing of polypeptides in the endoplasmic reticulum [18, 41]. CBMs also share properties with lectins that are not yet incorporated in the Carbohydrate Active enZyme database. For example the fucose-specific Anquila anguila lectin AAA is similar to Type C CBMs found in family CBM6 and CBM32 . Lectins which are classified as CBMs are incorporated into a family because they were found to share amino acid sequence identity with a known CBM appended to a carbohydrate-active enzyme. The most prominent feature that separates CBMs from lectins is the involvement of lectins in agglutination of sugar-containing molecules or glycoconjugates. Lectins often form quaternary structures as homodimers, trimers or tetramers with several binding sites which then agglutinate the target glycocongugate [39, 40]. CBMs themselves are not involved in the formation of quaternary structures and do not have agglutinating properties. Lectins are also thought to have a higher density of hydrogen bond formation with their carbohydrate ligand than CBMs and may differ in their ability to utilize thermodynamic contributions from solvent rearrangement during ligand binding (references). An excellent, brief historical overview of the discovery and characterization of lectins is available . Amino acid sequence-based classification of a CBM family may lead to the incorporation of other carbohydrate binding proteins within a given family, including lectins (such as ricin (CBM13), tachycitin (CBM14), wheat germ agglutinin (CBM18), fucolectin (CBM47), and malectin (CBM57)) and periplasmic solute binding proteins (such as CBM32). The community is open to incorporation of all carbohydrate-binding proteins within the CBM classification system based on the above criteria. A great review on laboratory approaches to studying the binding function of carbohydrate-binding modules is available . Typically, molecular biology techniques are used to overproduce a CBM protein in a host strain such as Escherichia coli which is then isolated and purified. Initial screening for carbohydrate binding interactions can be performed using screening techniques such as microarrays  or fluorescence microscopy techniques [26, 30, 43]. Several approaches can be taken to verify and quantify CBM-polysaccharide interaction, including affinity gel electrophoresis, UV difference and fluorescence spectroscopy, solid state depletion assay and isothermal titration calorimetry . Overall demonstration of carbohydrate binding function by CBMs is essential to understanding how these associated modules confer enzymatic specificity to carbohydrate-active enzymes. CBMs and their carbohydrate-binding properties are used for many different biological applications. Below is a list of several examples. Features of CBMs are currently being exploited to create designer CAZymes with enhanced or modified carbohydrate recognition functions [45, 46, 47, 48]. Family CBM9 can be used as an affinity tag to purify tagged proteins on a cellulose-based affinity column . CBMs are used as molecular probes to detect presence of specific carbohydrate motifs in plant [26, 43] and mammalian tissues [38, 50]. CBMs are used in fibre modification. Engineered CBMs have been shown to increase the strength of cellulose pulp in paper-making processes [51, 52], in crosslinking polysaccharide fibres for biomaterials  and cotton fibre modification . There are several examples of CBMs being used to immobilize whole cells onto carbohydrate surfaces [55, 56, 57]. CBMs are used to enhance bioprocessing enzymes for industrial uses in pulp processing and biofuel production [28, 58, 59]. Starch binding CBMs added onto transglucosylating enzyme CGTase from GH13 created a fusion enzyme with more efficient transglucosylating activity with soluble starch, important for industrial biotransformation processes . Tomme, P., Warren, R.A., Miller, R.C., Jr., Kilburn, D.G. & Gilkes, N.R. (1995) in Enzymatic Degradation of Insoluble Polysaccharides (Saddler, J.N. & Penner, M., eds. ), Cellulose-binding domains: classification and properties. pp. 142-163, American Chemical Society, Washington. Levy, I., Paldi, T., Siegel, D., and Shoseyov, O. (2003) Cellulose binding domain from Clostridium cellulovorans as a paper modification reagent. Nordic Pulp Paper Res. J. 18:421-428. Yokota, S., Matuso, K., Kitaoka, T., and Wariishi, H. (2009) Retention and paper strength characteristics of anionic polyacrylamides conjugated with carbohydrate-binding modules. "Carbohydrate-binding anionic PAM". BioResources 4(1):234-244.